Dorking is a town renown for its heritage, culture, and spirit. On the 14th December, the Dorking Musuem unveiled a blue plaque to celebrate the independent spirit of women of today and of a 100 years ago. 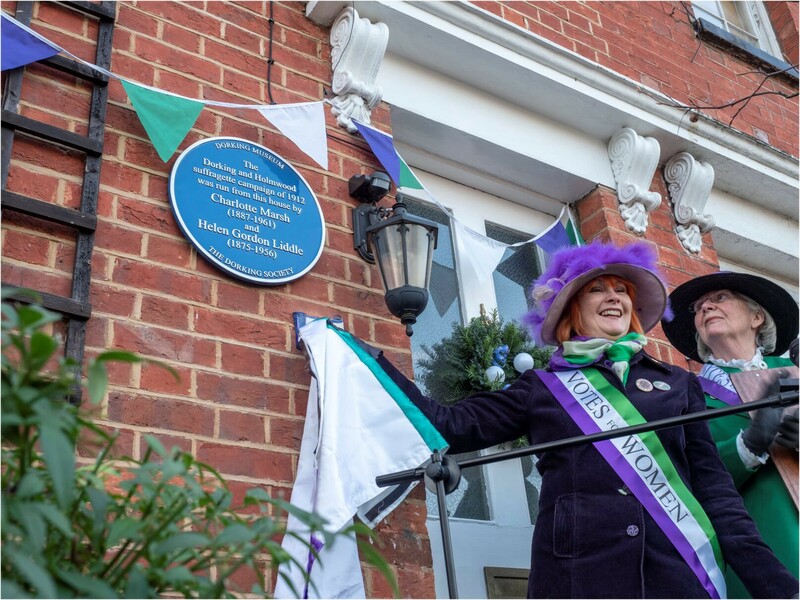 Coinciding to the day with the centenary of the first general election at which women were allowed to vote and to stand for election to Parliament, a blue plaque was unveiled on Friday afternoon (14th December) on the wall of number 43 Howard Road, Dorking. This house was at the centre of one of the local campaigns of the suffragette movement over a century ago. 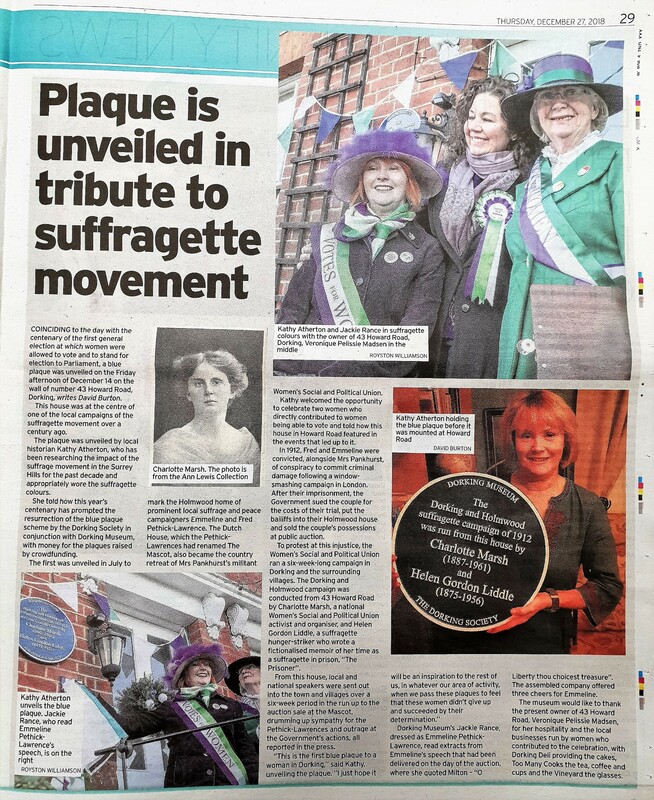 The plaque was unveiled by local historian Kathy Atherton, who has been researching the impact of the suffrage movement in the Surrey Hills for the past ten years and appropriately wore the suffragette colours. She told how this year’s centenary has prompted the resurrection of the blue plaque scheme by the Dorking Society in conjunction with Dorking Museum. The first was unveiled in July to mark the Holmwood home of prominent local suffrage and peace campaigners Emmeline and Fred Pethick-Lawrence. The Dutch House, which the Pethick-Lawrences had renamed The Mascot, also became the country retreat of Mrs Pankhurst’s militant Women’s Social and Political Union (WSPU). Kathy welcomed the opportunity to celebrate two women who directly contributed to women being able to vote and told how this house in Howard Road featured in the events that led up to it. In 1912, Fred and Emmeline were convicted, alongside Mrs Pankhurst, of conspiracy to commit criminal damage following a window-smashing campaign in London. After their imprisonment, the government sued the couple for the costs of their trial, put the bailiffs into their Holmwood house and sold the couple’s possessions at public auction. To protest at this injustice, the WSPU ran a 6-week-long campaign in Dorking and the surrounding villages. 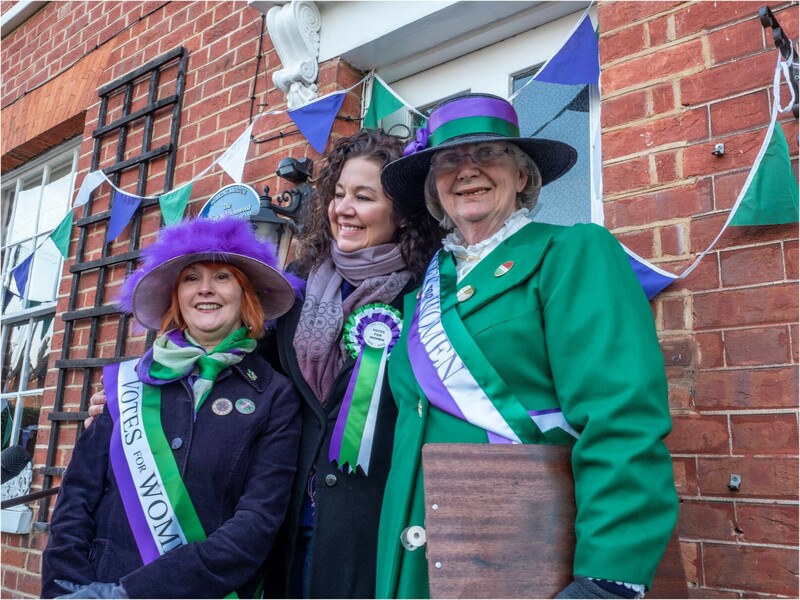 The Dorking and Holmwood campaign was run from 43 Howard Road by Charlotte Marsh, a national WSPU activist and organiser, and Helen Gordon Liddle, a suffragette hunger-striker whose home it was and who wrote a fictionalised memoir of her time as a suffragette in prison, ‘The Prisoner’. From this house, local and national speakers were sent out into the town and villages over a six-week period in the run up to the auction sale at the Mascot, drumming up sympathy for the Pethick-Lawrences and outrage at the government’s actions, all reported in the press. Dorking Museum’s Jackie Rance, dressed as Emmeline Pethick-Lawrence, read extracts from Emmeline’s speech that had been delivered on the day of the auction, where she quoted Milton — “O Liberty thou choicest treasure”. The assembled company offered three cheers for Emmeline. The Dorking Museum is located at 62 West Street Dorking Surrey RH4 1BS.